In FY11, the NIH funded 8,776 Type 1, 2, & 3 research project grant applications, so we would be looking at more than 25% fewer awards. At NCI, 1480 competing RPGs were funded in FY11, so cutting 300 awards would represent a 20% drop. I assume the cuts to other mechanisms would be proportional … or the ICs might shuffle funds around to protect R01s at the expense of other mechanisms. Now, the FY will begin with a continuing resolution, most likely based on FY12 funding levels, but this is not required (that is, Congress could go back to an earlier FY to set interim budget authority). Even though they may start out at FY12 budget levels, the ICs won’t know if these will precipitously drop come January, so will almost certainly not be making awards according to FY12 paylines. Your PO won’t know either, so there is no use in asking until the fiscal picture in DC becomes more clear. In the meantime, don’t hesitate to remind your Congressional delegation (and candidates for office) of the importance of sustained funding for scientific research in support of the physical, mental, and economic health of the nation. The FASEB Legislative Action Center offers excellent tools to help you contact the right folks and make the right points. Taking their cue from NIGMS and more recently NCI, NIAMS has now posted data on R01 funding for FY11 and FY10. Of note is the drop in payline from FY10 (15th percentile for established PIs/20th for new/ESI PIs) to FY11 (11th/15th) and FY12 (12th/15th). The main story from the FY11 bar graphs seems to be that NIAMS is true to its payline, with only 7% of its applications from new/ESI PIs selected for pay by exception (so you would need to be exceptionally exceptional to be tapped for select pay); established PIs fare better, with 29% of these applications funded above the payline … but none are tapped very high up the line (data only go to the 22nd percentile for FY11, and I would expect a similar trend for FY12). Beginning in FY 2011, NCI adopted a new approach to the selection of grant applications for funding that sets a zone within which nearly all applications are selected for funding. In both 2011 and 2012, that zone extended to the 7th percentile. Beyond that point, all applications are considered, resulting in a final success rate of 15% in 2011. And they are sufficiently stouthearted to accept comments. Kudos to NIGMS Director Jeremy Berg for continuing his release of funding data of extreme interest to the NIH extramural research community. Today’s gift, timely for Orthodox Christmas (Hristos se rodi ! ), summarizes FY10 award data, including percentiles of applications reviewed vs funded, success rates since 2006 (special line for the ARRA year), and total expenditures. What do we anticipate for the current fiscal year (Fiscal Year 2011)? At this point, no appropriation bill has passed and we are operating under a continuing resolution through March 4, 2011, that funds NIH at Fiscal Year 2010 levels. Because we do not know the final appropriation level, we are not able at this time to estimate reliably the number of competing grants that we will be able to support. We can, however, estimate that the number of research project grant applications in the success rate base (correcting for applications that are reviewed twice in the same fiscal year). We predict that this number will be approximately 3,875, an increase of 17% over Fiscal Year 2010. No surprise there. Hopefully Congress won’t have too many unpleasant surprises for the NIH appropriation either. 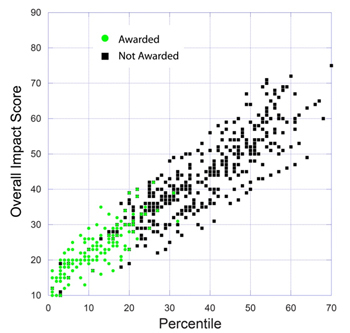 Jeremy Berg has posted data that will be of exteme interest to any NIGMS applicants: a plot of impact score versus percentile of the 655 R01 applications reviewed during the January 2010 Council round, including color-coded data points to identify which scores/percentiles received awards. Jeremy adds a note explaining that most of the black squares in the lower left quadrant (i.e., competitively scored but unfunded applications) represent Type 1 R01s submitted by PIs with more than $750K DC (including the submitted application). For those of you who weren’t aware, many ICs have policies that limit the number or dollar total of grant awards to any one lab … though exceptions can be made. Update: NIAID has officially announced their interim payline at the 6th percentile (also confirmed by Anthony Fauci at the September 2009 Advisory Council, with the hope that this can be raised to the 8th percentile at the January 2010 Council meeting), with a 10th percentile interim payline for new investigator R01s. So, for those non-ARRA applications submitted last February-March or thereabouts, what might your expectations be for the initial FY10 paylines? Think low. Painfully low, at least at the outset. However, in addition to uncertainty about funding levels, ICs are also struggling with the changes in scoring and the lack of a percentile base on which to make award decisions. Plus, they realize hundreds or perhaps thousands of RC1s will come back this fall, swelling the pool later in the fiscal year … and then all the lucky ARRA awardees will start submitting their competing renewals soon after, particularly those with bridge awards or one-year administrative supplements essentially serving as bridge awards. With a set (and limited) amount of money and uncertainty as to what scores will truly reflect the most highly meritorious applications and how many such submissions might come in, ICs will be erring on the side of caution to avoid setting a payline that cannot be sustained for the entire fiscal year – again, especially since they anticipate so many competitive applications in the pipeline. Imagine them subsequently reducing a payline mid-year … whereas it is possible to go back and pick up applications if the payline is relaxed. So, how painful will these initially conservative paylines be? The tentative interim FY10 R01 payline at one IC will likely be at the 6th percentile (which includes everything up to the 6.9th percentile in the new system), with the anticipation that this will move up to the 8-9th percentile once the NIH has its final appropriation and once data from at least 2 rounds of review are in. Program will have a smidge of wiggle room for discretionary awards such as bridge and select pay. Now, if you have found it difficult to get clear advice in the past from your POs about whether to resubmit should your score be on the bubble, you can imagine how noncommittal they will be in the months to come.